News Archives | Page 3 of 5 | Lapolla Industries, Inc.
Houston, TX (May 2, 2017) – Lapolla Industries, Inc. (OTCQX: LPAD), the global supplier and manufacturer of high performance, energy efficient building products, today announced the new and improved FOAM-LOKÒ 500 Spray Polyurethane Foam Insulation. The open-cell insulation is a high performance product designed to seal the building envelope and greatly enhance energy conservation and energy savings in the structure. Ideal for application in residential and commercial buildings of all types, FOAM-LOK 500 is low density and provides high-yield benefits. FOAM-LOK 500 is ideal for a variety of building envelope applications including use in walls, floors, ceilings (including vaulted and cathedral style) and attics. The material works by forming a completely sealed air barrier in wall cavities and can be utilized to fill 2” x 6” stud wall construction in a single application. FOAM-LOK 500 adheres tenaciously to most building materials and framing members and provides exceptional performance in the reduction of heat transfer. The improved insulation has passed the AC 377 End Use Configuration Criteria and meets the building code requirements for use with no additional ignition barrier required. Additional benefits of FOAM-LOK 500 Spray Polyurethane Foam Insulation are substantial and include noise attenuation and significant reduction in unmanaged moisture. Additionally, the product’s ability to superbly seal the envelope improves indoor air quality while reducing temperature fluctuations and the presence of hot and cold pockets inside, greatly enhancing the indoor comfort of inhabitants. FOAM-LOK 500 is a spray applied product with no mixing requirements. The insulation material is a water-blown technology with non-emissive catalysts in an added benefit to the environment. Lapolla Industries, Inc. (OTCQX: LPAD) is a global supplier and manufacturer of spray polyurethane foam for insulation and roofing applications, reflective roof coatings and equipment. Based in Houston, Texas, the company’s building envelope and roofing product solutions are designed to reduce energy consumption in the built environment, across the residential, commercial and industrial sectors, in both new construction and retrofits. Visit Lapolla Industries at www.lapolla.com. Houston, TX (June 6, 2017) – Lapolla Industries, Inc. (OTCQX: LPAD), a global supplier and manufacturer of high performance, energy efficient building products, today introduced its all-new FOAM-LOK 400 Spray Polyurethane Foam Insulation. An opencell solution for homes and commercial structures, the high-performance material is notable for providing ultra-high yield and enhanced energy efficiency, passing benefits to builders, contractors and inhabitants. Lapolla’s FOAM-LOK 400 and FOAM-LOK 500, another recently introduced open-cell insulation, have both been approved for use in the construction of Meritage Home’s new communities nationwide and will be on display at PCBC in Lapolla Industries’ booth #940. FOAM-LOK 400 is a great insulation for use in attics, cavity walls and other critical insulation areas. The professionally-installed spray applied material seals the structure, providing a continuous air barrier, offering exceptional performance in the reduction of heat transfer. These performance characteristics work to maintain indoor comfort and temperature, greatly reducing heating and cooling demands and the ongoing costs associated with them. The exceptional yield achieved with FOAM-LOK 400 is meaningful in that it passes cost savings to builders, contractors and consumers. Additionally, Lapolla believes that the material outperforms fiberglass and blown-in insulation options and comes close to being cost competitive with traditional insulations, while potentially offering a return on investment. “The noteworthy yield, energy efficiency and cost advantages of FOAM-LOK 400 are significant attractions for both builders and contractors,” said Doug Kramer, president and CEO of Lapolla Industries. “With FOAM-LOK 400’s potential to surpass the performance of competing products at a competitive price, we believe demand for this insulation will be high for use in new and retrofit home and commercial applications.” FOAM-LOK 400, like the recently introduced FOAM-LOK 500, firmly adheres to framing members and substrates and can be used to fill stud wall construction in a single application. Additionally, it has also passed the AC 377 End Use Configuration Criteria and meets building code requirements for use with no additional ignition barrier required. Additional benefits of FOAM-LOK 400 and FOAM-LOK 500 include noise attenuation and significant reduction in unmanaged moisture. Each insulation option also benefits contractors with no mixing requirements. Lapolla Industries will showcase the FOAM-LOK 400 and FOAM-LOK 500 open cell insulation products at the upcoming PCBC event on June 28 and 29 in the company’s booth #940 in the exhibit hall. Lapolla Industries Inc.(link is external) announced that its core building envelope products have been approved by the U.S. General Services Administration for inclusion in GSA Advantage(link is external). The program provides contractors with access to government-approved high-performance products for use in the construction of government buildings of all types, both domestically and abroad. As part of the prestigious GSA approval, numerous products of Lapolla’s core building envelope materials line are now available for purchase through GSA Advantage. These include Lapolla’s stand-out spray polyurethane products: FOAM-LOK 2000-4G, the next-generation closed-cell spray polyurethane foam insulation system, the first product of its kind globally to protect the ozone and reduce global warming impacts; FOAM-LOK 500, a new and improved open-cell spray polyurethane foam system offering high yield benefits to contractors; and FOAM-LOK 2800-4G, a rigid closed-cell spray polyurethane foam roofing system that may be applied over most new or retrofit roofing substrates and that, like FOAM-LOK 2000-4G, protects the ozone and reduces global warming impacts. Additional Lapolla products which have been GSA approved include: RCS 5001, a powerful restoration coating system utilized to protect and extend the life of a roof; and cutting-edge equipment facilitating proper and efficient installation of Lapolla’s products. Lapolla Industries, Inc., a global supplier and manufacturer of high performance, energy efficient building products, today introduced its all-new FOAM-LOK 400 Spray Polyurethane Foam Insulation. An open-cell solution for homes and commercial structures, the high-performance material is notable for providing ultra-high yield and enhanced energy efficiency, passing benefits to builders, contractors and inhabitants. Lapolla’s FOAM-LOK 400 and FOAM-LOK 500, another recently introduced open-cell insulation, have both been approved for use in the construction of Meritage Home’s new communities nationwide and will be on display at PCBC in Lapolla Industries’ booth #940. FOAM-LOK 400, like the recently introduced FOAM-LOK 500, firmly adheres to framing members and substrates and can be used to fill stud wall construction in a single application. Additionally, it has also passed the AC 377 End Use Configuration Criteria and meets building code requirements for use with no additional ignition barrier required. planning an expansion beyond U.S. soil. on the cost structure of the company’s sales model. business to accrue market share. the organization and its personnel’s home region. among potential clients and customers. company leadership should invest in learning as much from its local partner as possible. identify the correct channels — otherwise, even the most perfect marketing will go unseen. Does Everything Align? Go for It. rewards of a global business. Doug Kramer is President and CEO of Houston-based Lapolla Industries, a spray foam and coatings manufacturer. In 2010, he led the global expansion of the company and Lapolla’s products are now distributed in over 40 countries. http://lapolla.com/wp-content/uploads/2016/11/Texas-CEO-Magazine-Logo2.jpg 288 288 Lapolla Industries https://lapolla.com/wp-content/uploads/2015/12/lapolla-industries-spray-foam-cool-roof-supplier-logo-218x100.png Lapolla Industries2016-11-28 15:28:172016-11-28 15:29:52Thinking About Going Global? Houston, TX (September 22, 2016) – Lapolla Industries, Inc. (OTCQX: LPAD), a manufacturer and global supplier of high performance, energy efficient building products, today announced the company’s support of an ambitious amendment to the 1989 Montreal Protocol on Substances that Deplete the Ozone Layer. Joining forces with more than 500 national and international companies and organizations, as well as hundreds of sub-national governments, the company is calling for world leaders to pass the Montreal Protocol hydrofluorocarbon (HFC) phase down amendment, which will be voted on in October during a meeting in Kigali, Rwanda amongst signatories to the original Montreal Protocol. If world leaders adopt the amendment, it will enact an early first reduction step in HFC use for Article 2 countries and a freeze date for Article 5 countries. The amendment represents global action toward reducing the use and emissions of high-global-warming potential HFCs as well as a transition over time to more sustainable alternatives that enhance energy efficiency. Lapolla Industries is a Houston, Texas-based manufacturer and global supplier of building products including high performance spray polyurethane foam for insulation and roofing applications, reflective roof coatings and equipment. In 2014, Lapolla Industries became the first in the global spray polyurethane foam sector to eliminate ozone depletion potential (ODP) and reduce global warming potential (GWP) in its product line. The company accomplished these initiatives through an aggressive re-engineering of its product chemistry. Development of Lapolla’s product line innovation commenced approximately four years ago. CEO Doug Kramer was subsequently invited to participate in the prestigious President’s Climate Action Plan roundtable at the White House alongside the Environmental Protection Agency (EPA) and some of the nation’s most recognized business leaders. In addition to the proven environmental benefits, the innovation in Lapolla Industries’ fourth generation spray polyurethane foam product line produces additional product yield, resulting in lower installation cost and greater ROI and savings to the consumer. 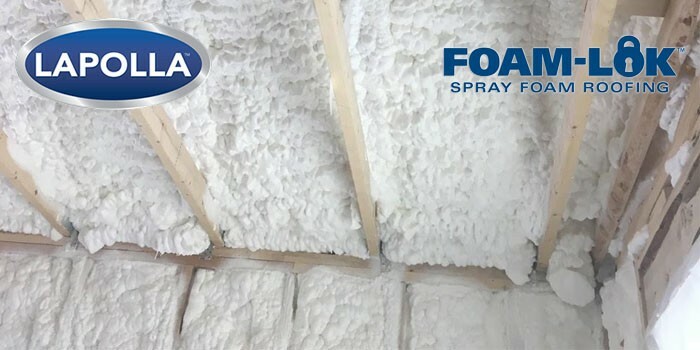 Lapolla’s fourth generation spray polyurethane foam products include: FOAM-LOK™ 2000-4G Spray Foam Insulation, FOAM-LOK™, and FOAM-LOK™ 2800-4G Spray Foam for Roofing and all other closed cell spray foam systems. While applications for each vary, all provide standout performance in energy efficiency by reducing the energy consumption of a home or commercial building up to 45 percent. Lapolla Industries, Inc. (OTCQX: LPAD) is a global supplier and manufacturer of spray polyurethane foam for insulation and roofing applications, reflective roof coatings and equipment. Based in Houston, Texas, the company’s building envelope and roofing product solutions are designed to reduce energy consumption in the building environment, across the residential, commercial and industrial sectors, in both new construction and retrofits. Visit Lapolla Industries at www.lapolla.com. Houston, TX, September 12, 2016 – Lapolla Industries, Inc. (“Lapolla” or the “Company”) (OTCQX: LPAD), a Houston-based global supplier and manufacturer of spray polyurethane foam insulation, roofing foam, reflective roof coatings, and equipment for their application, announced today that by significantly reducing outstanding debt and obtaining a $15 million line of credit with Bank of America, N.A. on September 7, 2016, the Company will be able to reduce interest expense by 78%. “This is a significant milestone for Lapolla and is the direct result of our corporate commitment to success and financial diligence. The reduction of debt and lower cost of capital will provide significant value to Lapolla and our shareholders while supporting our continued growth. We have been extremely fortunate to have had Enhanced Capital and Bank of America as our partners over the years and we are very appreciative of their support.” concluded Mr. Kramer. Lapolla Industries, Inc. is a global supplier and manufacturer of spray polyurethane foam insulation, roofing foam, reflective roof coatings, and equipment for their application designed to reduce energy consumption in the residential, industrial and commercial markets for both new construction and retrofit applications. More information is available at www.lapolla.com. Certain statements in this press release that are forward-looking and not statements of historical fact are forward-looking statements within the meaning of the safe harbor provisions of the Private Securities Litigation Reform Act of 1995. Forward-looking statements are generally identifiable by the use of words like “may,” “will,” “should,” “could,” “expect,” “anticipate,” “estimate,” “believe,” “intend,” or “project” or the negative of these words or other variations on these words or comparable terminology. The reader is cautioned not to put undue reliance on these forward-looking statements, as these statements are subject to numerous factors and uncertainties outside of our control that can make such statements untrue. More detailed information about the Company and the risk factors that may affect the realization of forward-looking statements is set forth in the Company’s filings with the Securities and Exchange Commission (SEC), including the Company’s Annual Report on Form 10-K and its Quarterly Reports on Form 10-Q. Investors and security holders are urged to read these documents free of charge on the SEC’s web site at http://www.sec.gov. The Company assumes no obligation to publicly update or revise its forward-looking statements as a result of new information, future events or otherwise. Typically, a company’s success is commonly measured by financial indicators, such as growth in revenue, market share and profitability. But what happens when you apply a different standard of measurement to the success of your company? Environmental responsibility is one such standard that some organizations are now striving to achieve. Rather than measure success in financial terms, environmental responsibility assesses whether a company is doing the right thing for the community and environment. So another question to ask is: Can doing the right thing create potential business opportunities? And can these opportunities – in addition to financial measurements — be another indicator of organizational success? Companies are often driven by, and toward, financial results. But environmental responsibility is often associated with higher costs. Because of that, many companies do not view sustainability practices as a measurement of success, which makes it uncommon for companies to do the right thing for the environment. There usually needs to be an expectation that the environmental effort will also benefit the business in some way. When our team began to consider making environmentally positive changes to its product line, we believed there would be a benefit to our business. In a previous post, I mentioned that we expected our environmental stewardship to positively influence our bottom line, as we had conducted a lot of research and identified ways to achieve both savings and greater product yield through this innovation. These assumptions proved to be correct. But what our team did not presume was that there would be additional positive results beyond those directly affecting the environment and our bottom line. We’ve been pleasantly surprised. First and foremost, environmental stewardship has the power to showcase the organization as a true leader. If you are the first in your industry to uniquely employ sustainability measures, that effort will be recognized by your clients and industry. Depending on how you are driving that stewardship, you may also showcase innovation of other kinds via technology advancements, efficiencies and new ideas. And you may be able to achieve and drive additional product or service enhancements through your environmental stewardship efforts. Driving sustainability practices within your company may lead to something else you haven’t even thought of – improved employee morale. When workers know that their company is influencing positive change in the world, they tend to feel good about working for that organization. In essence, they are proud to be part of it. This in turn will likely lead to increased loyalty, good word-of-mouth referrals, PR and even improved performance. In addition to the positive influence on your company and its team members, you may also be able to forge a path within your industry. This can showcase your organization as the catalyst for positive change industry-wide, garnering improved recognition for the company and even attracting new talent, who want to be part of the movement you’ve started. When you decide as an organization to employ sustainability measures, it also puts you in the unique position to stay ahead of regulators and to be a model of inspiration to them, rather than a subject that needs to be policed. As such, you become an example of what to do, rather than what not to do, spotlighting the organization as one that is both progressive and responsible. In 2014, in parallel with our commitment to re-engineer the chemistry of our product line to eliminate ozone depletion potential and reduce global warming impacts, we were invited to participate in the President’s Climate Action Plan Executive Roundtable at the White House alongside both the U.S. Environmental Protection Agency (EPA), Department of Energy and a short list of CEOs from some of the country’s most recognized companies. The goal of the roundtable was to lead the discussion toward real actions that would “green” American made products in an effort to protect the climate. Our invitation to participate in this prestigious discussion was a catalyst that allowed us to help drive environmental change in both its industry and the business community at-large, prior to regulations being instated which would force those changes upon us. In essence, we were able to drive positive change, rather than be driven reluctantly by regulations. We had never expected to have a seat at a discussion of this caliber, and we never would have had we not been the first in our industry sector to drive the environmental stewardship we believed was truly needed. Our product innovations led us to not only being invited to participate in the President’s Climate Action Plan roundtable discussions two years in a row, but it also resulted in the EPA showcasing Lapolla as an environmental leader with both domestic and international business audiences. For example, in 2015, the EPA and State Department brought a delegation from India to our headquarters to educate them on the company’s innovations and the positive environmental impacts garnered from them. In short, if you drive sustainability measures and practices in your company and industry, it is not only possible to positively impact your bottom line, but also to garner surprising results. Whether these include an elevated reputation in the business community, improved employee morale or being showcased by regulators as a model of best practices, you might be surprised what positives await you through environmental stewardship. HOUSTON–(BUSINESS WIRE) — Lapolla Industries, Inc. (“Lapolla” or “Company”) (LPAD), a Houston-based global supplier of energy saving products, today announced it has qualified and started trading on the OTCQX® Best Market, operated by OTC Markets Group, effective July 1, 2016. The OTCQX market is reserved for established, investor-focused U.S. and global companies that meet high financial standards, provide timely news and disclosure to investors, and are sponsored by a professional third-party advisor. Lapolla is the first manufacturer, globally, to commercialize a third party tested and approved wall foam insulation system that uses an HFO cutting edge technology, offering an environmentally friendly, zero ODP and ultra low GWP. 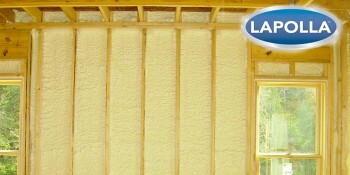 Lapolla’s FOAM-LOK 2000-4G (4th Generation) not only delivers environmental benefits that are 99.9 percent better than today’s most commonly-used blowing agents, the 4G now provides enhanced insulation values and yield from previous generation technology, bringing economic and bottom-line value to contractors and consumers. Ty Pennington, from two time Emmy award winning Extreme Makeover – Home Edition (broadcasted on ABC), is the celebrity spokesman for Lapolla. Kramer said, “Driving consumer awareness and pull through is our goal as all consumers are looking for ways to gain not only energy savings, but also high performance homes.” Pennington commented, “This is personal for me. My mother struggled for many years with asthma and we are all aware of the growing epidemic levels of respiratory sensitivities. Lapolla’s 4G helps create better air quality by eliminating unwanted, unconditioned air, from entering the building. These airborne pollutants are one of the growing reasons for the surge in asthma among children. I have Lapolla 4G technology in my home,” said Pennington. “At the end of the day, the clear global strategy, the strong management team, the 4G advanced technology, the global network, the consumer messaging, and the financial results, will drive shareholder value,” Kramer concluded. U.S. investors can find current financial disclosure and Real-Time Level 2 quotes for Lapolla on www.otcmarkets.com. “Greening” your company, via any number of means, obviously brings multiple benefits to the physical environment. But while going green may be the responsible thing to do, many companies shy away from these sustainability measures. The reason is their (common) misconception that the costs will outweigh any benefit, that there is no bottom-line value in environmentally responsible business practices. In fact, this belief may be false, because setting a green path can often improve your bottom line. So, why set a green path for your own company? “Sustainability” is a catch-all phrase that refers to the science, or practice, of acting so as not to harm the environment, protecting (rather than depleting) natural resources and supporting long-term ecological balance. In business, sustainability may refer to any number of operational, technological or product efforts that support environmental protection. For example, some companies set a green path by utilizing environmentally-friendly materials and/or locally sourcing those materials for the manufacture of their products. Other activities include: producing products that may be recycled at the end of their lifespan for material reuse; reducing energy consumption in operations; or even re-engineering distribution methods as a means of reducing long-distance travel during product delivery, ultimately reducing fossil fuel consumption (and the disease-causing air pollution that is its byproduct). These represent just a handful of ways to improve sustainability in business. There are many additional ones that will help ensure the protection of the environment. Some of these green measures also have the power to meet customer demands, representing a positive image for the business as well as a positive move for the environment. Keep in mind something else: Very few businesses can claim no competition. When done well, innovation in environmental sustainability can create market differentiation as well as opportunity. And most entrepreneurs understand that you are either leading or following. Thus, innovation may be a matter of survival. And, what’s more, not all sustainable innovation needs to be profound, or novel. It is more important that the effort deliver value, perceived or otherwise, to your customers. When determining how your organization may best employ sustainability measures, keep in mind that research and development cannot dictate your customers’ needs; your customers do that. Start by analyzing your market to determine what your customers’ needs truly are, then develop a plan to provide a solution to meet them. The challenge will be finding ways to effectively incorporate meaningful “green value” to the solutions you aim to provide, whether they lie in technology, operations, end product for sale, etc. Ideally, the green value will carry not only the marketable perception among customers that your company is being green, but should also yield a potential net value, such as cost savings or efficiency. One benefit of setting a green path is the likely belief among customers, business partners, employees and others stakeholders in your company’s goodwill. Some customers will even pay more for eco-friendly products. Unfortunately, scale in business is critical and the potential consumers interested in goodwill or sustainable products only may not be sufficient in number to justify the expense of the innovation. So, instead, focus on net cost savings to your company, market differentiation or savings to the consumer to help ensure ultimate success. In 2014, the company I lead — Lapolla Industries — decided to forge a path ahead of our competition by re-engineering the chemistry of our core product line. This innovation in materials technology aimed to mitigate two negative environmental impacts common to all competing products in our space: ozone depletion and global warming impact. Essentially, the innovation allowed us to bring to market a “next-generation” product line of spray polyurethane foam for insulation and roofing that represented a much more environmentally friendly solution for homes, commercial structures and consumers at-large. While many of our competitors hesitated to make similar product sustainability improvements (presumably for cost reasons), it was important for us to complete this move ahead of them or any future regulation. Not only was it the right thing to do, but we also recognized the power it gave us to set ourselves apart from the group, as well as to positively impact our bottom line. Many business leaders today refuse to employ sustainability measures, as they believe the cost will outweigh the benefit. However, viewing sustainability measures simply from a cost perspective may be shortsighted. Focus, instead, on the innovation fundamentals that will deliver both consumer and bottom-line value. Because bottom-line value can be defined in two ways — as an increase in market share or as a reduction in costs — different avenues exist for linking your environmental responsibility to such growth. As long as your efforts grow your financial stability, it doesn’t matter which direction that growth comes from. When our company sought to make our spray foam products more eco-conscious, we collaborated with raw material suppliers to innovate through technology. This allowed us to achieve the new thresholds while also achieving a net cost savings for our customers. Although the technology cost was 10 percent more than our previous generation of products, the net savings to our customers was approximately 10 percent, achieved through a pick-up of 20 percent in added efficiency. This resulted in a market interpretation of innovation, market leadership and goodwill, as well as consumer cost savings — a true win-win all around. We believe success of this kind is achievable by businesses of many types, and that if more leaders jump on board, our planet will be much better off.